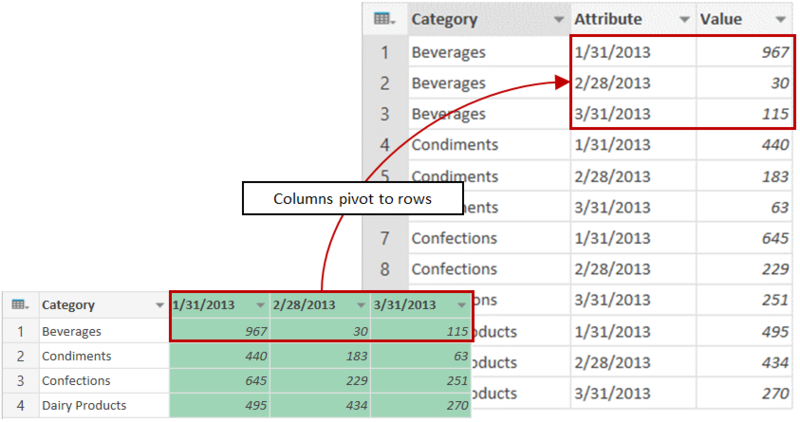 In Power Query, you can transform selected columns into attribute-value pairs where columns become rows. You use Power Query's Query Editor to unpivot columns. First, select one or more columns in Query Editor. You can unpivot columns by using the Query Editor ribbon button, or by using a context menu. In the Query Editor ribbon, click Unpivot Columns. Right-click the selected columns, and select Unpivot Columns. Unpivot Columns creates an Attribute column for each selected column heading and a Value column for each selected column cell value. The attribute-value pair columns are inserted after the last column. In the example above, each date column becomes a row with an Attribute column containing the date value and a Value column containing the date column value. If you add an additional date column to the original source table, Power Query adds an additional row to the Unpivot table.